Australia has said it will begin legal action against Japan over its whaling in the Antarctic. It will argue that the annual whaling hunt in the Southern Ocean is in violation of an international ban on commercial whaling. Japan, which kills hundreds of whales ever year, says the hunt is carried out for scientific research purposes. Critics say this is a cover for commercial whaling and that whale meat not used in research is sold for food. The Australian government says it will lodge formal proceedings at the International Court of Justice in The Hague next week. The move comes ahead of a meeting of the International Whaling Commission (IWC) in Morocco next month, where agreement is being sought on a new approach to whaling, which would allow commercial hunting but with strict quotas. Australian Environment Minister Peter Garrett and Attorney General Robert McClelland said in a joint statement that the move underlines their "commitment to bring to an end Japan's program of so-called scientific whaling". There has been a ban on commercial whaling for 25 years, but a Japanese whaling fleet heads to the Southern Ocean each southern summer to harpoon hundreds of whales as part of what it calls lethal research, which is allowed. 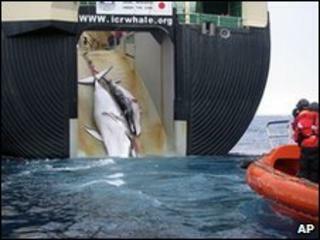 Australia had tried to negotiate an end to these forays and had given Japan until November to stop this form of whaling. It then brought forward its plans to take the matter to court. Whales - 'resource' or 'right'? Conservationists have broadly welcomed the legal action, praising the government of Prime Minster Kevin Rudd for standing up to Japan. But the BBC's Sydney correspondent Nick Bryant says that the Australian Greens have said it is essentially a political move from a prime minister, who has been slipping in the polls, to make good on a election promise made three years ago. Japan is Australia's second biggest trading partner, and Canberra says it hopes the move will not damage their friendly relations. The Japanese fisheries ministry has described the legal action as "very disappointing". "We will continue to explain that the scientific whaling that we are conducting is lawful in accordance with article eight of the international convention for the regulation of whaling," said the ministry's deputy press secretary Hidenobu Sobashima. Mr Sobashima said the issue "shouldn't jeopardise the overall good relations between Japan and Australia". The Australian Foreign Minister Stephen Smith said the two countries have agreed to treat the matter as "an independent legal arbitration of a disagreement between friends".